Attendance Certificates are the perfect way to acknowledge the tenacity of pupils (and their parents!!) who make it into School every day. There is a strong correlation between good attendance and high standrds of achievement and so it is really important to encourage in as many ways as possible. These certificates are available in Sparkly Holographic material - printed on high quality 400gsm card. 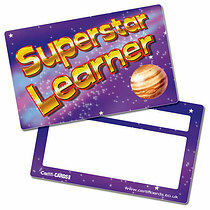 You can see the full Attendance Award Range here, and all of our Holographic Certificates here.